@Donna B, @crisbd, As far as I can tell, every cartoon posted by Dan includes the signature of the cartoonist. And he often lists the cartoonist by name, at least once he gets familiar with his/her work. I guess that’s my fault, I just pointed out this cartoon at Reason to Dan, but didn’t bother to find out who to give the credit to… Sorry! Scott Stantis does indeed deserve the richly-deserved plaudits for this. on July 28, 2012 at 7:35 pm Donna B. The cartoonist is the excellent Scott Stantis. Because you didn’t link to him, or even said his name. 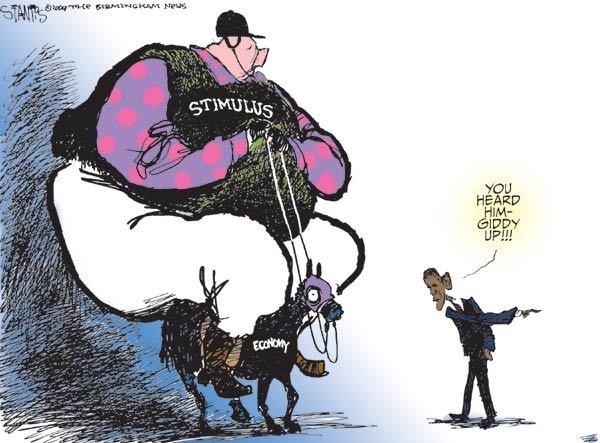 I think the best stimulus cartoon would be a giant fan (stimulus) placed in front of a wind turbine (the economy) and politicians connecting the fan wires to the electricity being produced by the turbine. The house powered by the turbine could be labeled “consumers”. A variation would be a stimulus light bulb in front of a solar panel, again politicians connecting the wires at the inauguration ceremony. Having Al Gore in the corner yelling “It’ll only work if you use an efficient CFL bulb”, would make two jokes in one picture. It is a wonderful cartoon, isn’t it, glad you reprinted it. But what makes it one of the very best is that it makes just one point very clearly. If you try to get it to also make another point, then the clarity of the message is diluted, it loses impact! Any stimulus would have been misdirected and ineffective, even if guided by a desire to invest wisely. Obama’s stimulus had none of those characteristics. The short-run economic imperative was to identify as many campaign promises or high priority items that would spend out quickly and be inherently temporary. The stimulus package is a key tool for advancing clean energy goals and fulfilling a number of campaign commitments. Oh this is just toooo good!